Home » Prebiotics & Probiotics	» What Are Probiotics? You might be asking, what are probiotics? If you are curious what they are, then you are on the right track since understanding these microorganisms will be good for your digestive system. Knowing what else can help keep your digestion in good order is even better. If you want to keep your gut healthy, here are some things you ought to know. Our digestive system is responsible for breaking down the food we eat and distributing the nutrients these foods contain all throughout our body. If this part of our anatomy is not working as it should, then the rest of us will suffer. Having a healthy digestive system is also necessary to protect ourselves from most diseases. Digestion has a strong connection with our immune system, which we all know is our protection against sickness. The stronger our immune system is, the stronger we are at resisting diseases. All in all, almost all functions of the human body is somewhat connected, directly or indirectly, with the digestive system so keeping it in good condition is necessary. There had been much interest in the benefits that probiotics can provide to our digestion. These are live microorganisms that can be in the form of good bacteria, yeast or bacilli. They can be found in fermented foods which when consumed, are said to inhibit the growth and activity of harmful bacteria, pathogens and toxins. Those who support the use of probiotics have claimed that these microorganisms are highly effective in preventing urogenital infections, atopic illnesses and digestive problems ranging from diarrhea to more serious diseases like chronic inflammation in the intestines. Mostly, studies have presented enough support when it comes to the health benefits of probiotics. However, one point of contention has something to do with claims that any health benefit that probiotics can provide is actually minimal at best. Some studies have intimated that the structure of these microorganisms are altered, and their efficacy diminished, once they undergo processing or treatment. To put in simpler terms, processed foods that are supposed to contain probiotics may not be as effective as expected. In the past few years, another group of studies has emerged; this time, focusing on the beneficial effects of prebiotics. If you ask – what are probiotics? ; then it is logical for you to also want to know what prebiotics are and whether there are differences between the two. Basically, prebiotics are dietary fibers that stimulate the growth of good bacteria. They have been found to have beneficial effects on the gut, partly because they promote a healthy intestinal flora and also because of their ability to induce metabolic activity, which results in improvements in overall health. Compared with probiotics, these dietary fibers are non-digestible, but in a good way. This means that regardless of the processes they are put through, they remain intact when they reach the intestines. Because prebiotics reach the stomach in their unaltered form, they are able to do their work more effectively. Aside from promoting good bacteria and inducing metabolism, prebiotics are also known for their power to provide the stomach with stronger resistance against pathogens, toxins and other unwanted materials that may cause illnesses. Some of the foods that act as good prebiotics are kiwi fruit, artichokes, garlic and asparagus. There are various dietary supplements geared particularly for promoting and maintaining digestive health. Contrary to some people’s assumptions however, they differ from one another in more ways than one. Just because a nutritional supplement is marketed as a digestive supplement does not mean that it can be effective in promoting digestive health. For consumers, those that contain prebiotics are the best options. Probiotics are good for the body, but most of the time, they will not work unless prebiotics are also present. In addition, prebiotics have a set of beneficial effects that are unique to these dietary fibers. 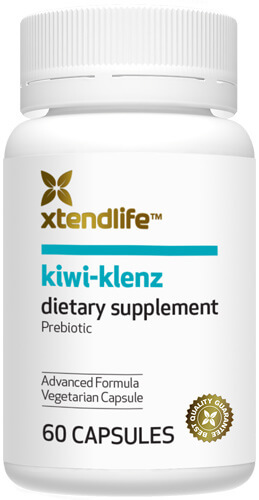 When it comes to a particular brand, Kiwi-Klenz from Xtend-Life is currently the one I use and I personally recommend. Kiwi-Klenz is made from all-natural ingredients and is based on kiwi fruit, one of the best sources of prebiotics. So, to conclude, probiotics are microorganisms that are helpful to maintaining digestive health, but if you want something better, you should be looking for prebiotics instead.